We are pleased to announce that PARTTEAM & OEMKIOSKS will be present at the Restaurant & Takeaway Innovation Expo 2018, one of the UK's largest catering, retail and tourism events. 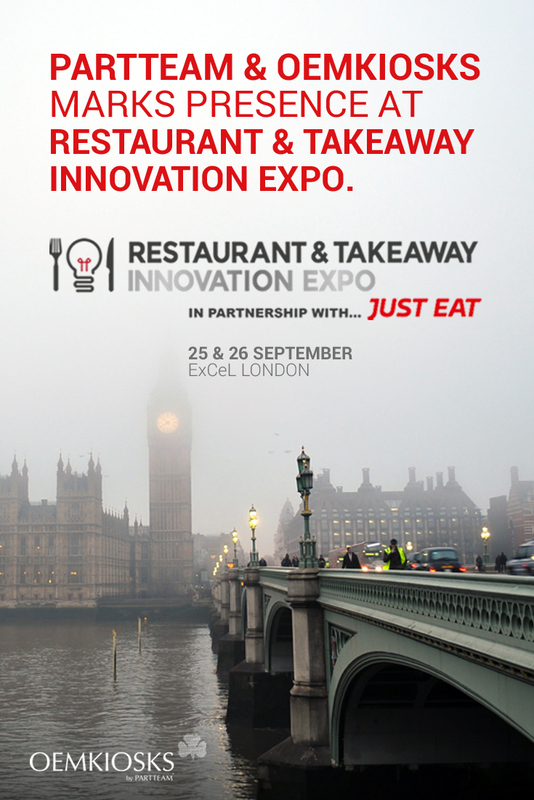 The Restaurant & Takeaway Innovation Expo 2018 will take place from 25th to 26th September at the renowned ExCel (Exhibition Center London). PARTTEAM & OEMKIOSKS presents a set of customized technological solutions for the catering industry, such as QSR self-service kiosks, check-in / check-out, digital billboards, queue management and more! Raising the awareness of the players in the catering, retail and tourism industry to the excellence of PARTTEAM & OEMKIOSKS technological solutions is one of the objectives that leads the company to participate in this event. The event offers visitors the opportunity to participate in more than 200 seminars led by industry experts, meet exhibitors with more than 500 specialized service providers and also promote networking and knowledge sharing among attendees and visitors to the event. Each project meets a different need. PARTTEAM & OEMKIOSKS develops and manufactures digital kiosks and billboards for each project. Be sure to take part in this event, made especially for all the stakeholders of the catering industry, commerce and tourism. PARTTEAM & OEMKIOSKS invites all its customers, partners and friends to attend this event. Come and talk with PARTTEAM & OEMKIOSKS and know about the latest technological innovations and all the advantages you can enjoy in partnering with a company that is recognized internationally. To schedule a meeting with us click here.